The New York Times reported on July 27, 2015 that the "[ur=http://www.nytimes.com/2015/07/28/us/boy-scouts-end-nationwide-ban-on-***-leaders.html?_r=1]Boy Scouts End Ban on *** Leaders[/url]." I warned America that Canadian Scouts (CS) decided to allow females, atheists, agnostics, homosexuals, bisexuals and transsexuals to join the CS. In 1999, they approved the establishment of an all-homosexual troop, which now marches in Canada's "*** pride" parades. Within five years, scouting membership dropped over 50 percent. Many scouting camps and offices were closed, and the staff was laid off. 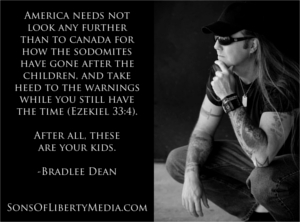 Brian Rushfeldt, president of Canada Family Action, stated, "The notion that we need to protect homosexuals more than we need to protect children ... has been a disturbing trend."